For the 1993 Game Gear game by Virgin Interactive, see Double Dragon (Game Gear). 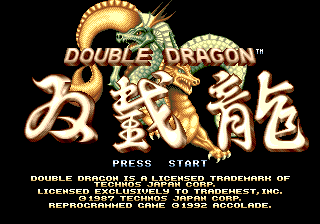 Double Dragon (ダブルドラゴン) is a side-scrolling beat-'em-up by Technos released for the arcades in 1987. It's considered a spiritual sequel to Technos's previous hit Renegade, while also serving as a precursor to later games in the genre such as Final Fight and Streets of Rage. The game was ported to several consoles and home computers since its original arcade release, including to Sega consoles twice: the first time was for the Master System by Sega themselves in 1988, and later for the Genesis in 1992 by Accolade. Near the end of the 20th century, violence ruled the streets of New York City after the nuclear war and people began forming gangs to survive. On the outskirts of the city lived twin brothers named Jimmy and Billy Lee. The brothers used to run a martial arts school in the centre of the city which was burned down to ashes five years ago as a result of the nuclear war. Despite this, the brothers did not neglect their training for even a day. The younger brother, Billy, was romantically involved with a female instructor named Marian, but Jimmy was secretly in love with her as well. One day, Marian was abducted by the Black Warriors, a savage street gang led by a man named Willy Mackey. The gang gradually grew in size after the nuclear war and they are now dominant organization of the city. The Lee brothers set out to confront the Black Warriors and rescue Marian. Double Dragon is a side-scrolling action game that can be played by up to two players simultaneously. Player 1 controls Billy Lee (who wears the blue outfit), while Player 2 controls his twin brother Jimmy (in red). The objective of the game is to defeat every enemy from one area to the next until reaching the end of the stage and defeating the boss. The controls of the original arcade version consisted of an eight way joystick and three buttons (kick, jump, punch). The player can move not only left or right, but also towards or away from the background. The basic attacks consists of a left-right punch combo and a kick. After a couple of punches or a single kick, the enemy will be in a stunned pose. During this period, the player can follow it up with an uppercut, a roundhouse kick or a head grab (depending on the enemy type). During a head grab, the player can repeatedly kick the enemy with their knees or throw him to the other side. Other moves including a jump kick, an elbow strike, a leaping reverse kick and a headbutt. Some enemies can also be grabbed from behind during 2-players mode, allowing your partner to attack him. There are also seven types of weapons that are either, found on the ground in certain areas or by disarming an armed enemy. To pick up a weapon, stand near it and pick it up with the punch button. While armed, the weapon can be used by pressing the punch button. Certain large objects can also be kicked to the ground with the kick button. The Master System version is a downscaled adaptation of the arcade game similar to the NES version released before it. While the character designs are pretty similar to the NES version, the Master System version retains the 2-player co-op mode and features level designs much closer to the arcade game (albeit, without the vertical scrolling and climbable ladders/fences in some areas). Because the arcade version used a three button setup (with a dedicated jump button), the input method of certain moves such as the flying jump kick, backward spin kick and elbow strike were changed to better accommodate the Master System's two button controls. The consecutive attacks (the uppercut and roundhouse kick) and the hair grab are also performed a bit differently. The Master System only displays up to three enemies and a single weapon on-screen at once. In contrast, the Mega Drive version is a relatively straight port of the arcade with slight differences in graphics and sound. Most notably the backgrounds graphics are different, some of the character sprites (specifically Marian and Linda) are not 100% accurate and the head-swapped boss characters (the mohawked version of Abobo at the end of Missions 1 and 3, and the Lee brother lookalike at the end of Mission 2) are replaced with plain palette swaps. Main article: Double Dragon/Magazine articles.